You can check-in to boat at 12PM and check-out at 9AM. Their will be a stay of 21 hours in houseboat. Houseboat have a fixed menu of Kerala dishes. 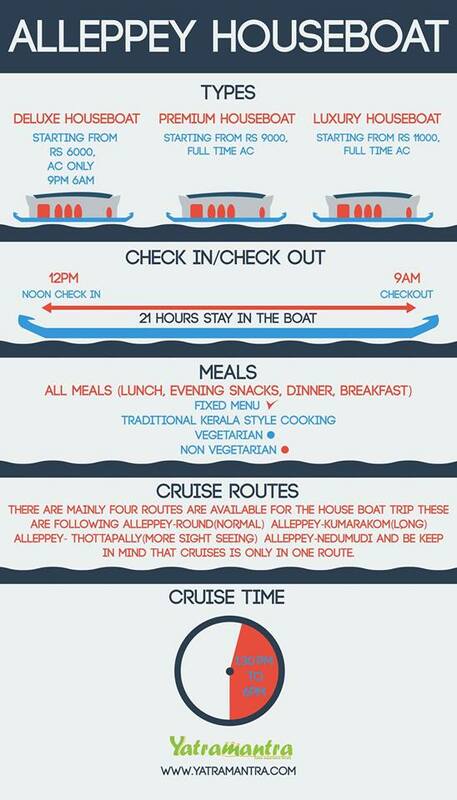 As we check-in at noon the houseboat provides the lunch, Evening snacks is also available. You will enjoy the cruise with special dinner. Next morning will gives you warm surprises,enjoy the beauty, have your breakfast and it will be the time to say goodbye. Kerala is the state having all the little beauties. If you are planning for a Kerala Tour Package then please go through the link. Need a dayntime houseboat from Alappuzha for 7 adults and 2 children. Please give options, timing and tariff.